When is it really Public Speaking? If you're talking with a couple of colleagues at work is that public speaking? If it's a chat with a few friends at the bus stop is that public speaking? Is it when you're in front of your class teaching? And the real question tucked in behind those, riding on their coat tails, is when does public speaking become something to be frightened of? Your answers will be uniquely personal. All of us have comfort zones in which we feel safe, un-threatened, OK with ourselves. I think of those zones as circles radiating around us. Imagine you're standing in the middle of comfort zone now. Close your eyes and see if you can locate where speaking tips over, out of your comfort zone into scary, official, capital letter FEAR OF PUBLIC SPEAKING? As a communicator-speaker it's useful knowledge to identify and own that tipping point opening the door to unleash a horde of bouncing fear-balls. Years ago I developed an exercise to help myself which I later honed to help others. Visualize two types of circles: "Them" and "Us". In your "Us" circles are all the situations and people you feel good with. These are your comfort zones where speaking is generally effortless and anxiety free. For me they included: family, friends, the classes I taught, and some of the colleagues I worked alongside. Now focus on the "Them" circles. What situations and people are in these? Be really honest. What, and who, brings on a dose of self-doubt and rapid back-peddling to safety? I discovered my "Them" circles were full of people whom I felt were more articulate, confident, intelligent, authoritative, and powerful than me. They were all looking, judging and seeing that I knew, as my father used to say, sweet 5/8ths of nothing in particular. Zip in other words. Now that was scary! But what was more scary was how quickly I let my imagination create a self-limiting and defeating reality. It was Eleanor Roosevelt who famously said "No one can make you feel inferior without your consent.” She's so right. Were those "Them" people actually more confident, articulate, intelligent, or any of those other things, than me? No. Were they really looking at me and seeing an incompetent? No. That is, not unless I gave them proof or evidence of that through lack of preparation and practice! The key to releasing myself was realizing that it was within my power to challenge that perception in two ways. One was to consciously stop putting myself needlessly down and the second was to take all the opportunities I could to up-skill. The combination put "Thems" in my "Us" circles. What about you? What, or who, is sitting in your "Them" zone holding you back? 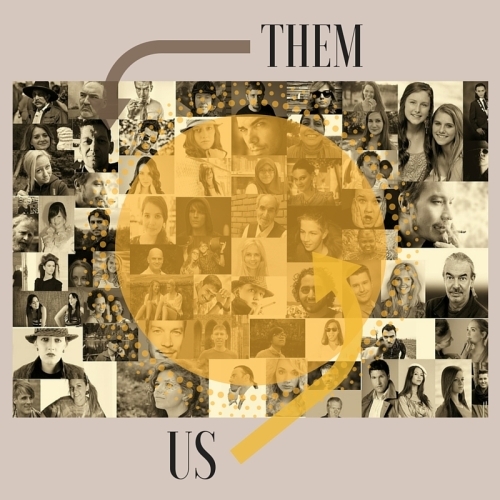 Are you ready to turn "Them" into "Us"? I fully realize that shifting mind frames is stressful and much easier to talk about than actually do. It takes courage to summon up the will power and commit to changing long held belief patterns. But you can do it one step at a time. It's not all or nothing. Start small and build. Here's five strategies to meet the challenge of self-limiting behaviors - with ongoing links to more. Use these tips to help yourself push through. There is another side and you will find it. Your world does not have to be "Us" and "Them" and your voice deserves to be heard. And for those of you who'd like a self-service course in the form of emails check out Letting go of fear of public speaking. It's a very popular freebie. Literally hundreds have signed up to receive it - an average of 2 or 3 a day over the past couple of years. A round up of pages, either revamped with added information or new on the site. Public speaking games - "Thank you for making my class fun and not scary. ", "Your materials provide great structure and content examples. My students have experienced a drastic improvement." Updating a page with wonderfully glowing testimonials is great - the sort of work I love. It's so affirming to know from others that playing speech games has helped students overcome fear and released their voices. If you teach public speaking check out game playing. Speech writer - If you're totally flummoxed, or pressed for time, and that special speech you were supposed to be writing is not happening, my services are available. I truly do enjoy this work! How to develop a manly voice - Practical, no nonsense steps with great explanations on developing a strong, clear voice from a wonderful resource website primarily aimed at men but so good I recommend it to anyone!